Posted on Wednesday, October 8th, 2014 at 8:06 am. Adult learners are more attentive and absorb more information when they participate in the learning. To take your training skills to the next level, consider joining the Train the Trainer Training Course offered by pdtraining in Philadelphia, Charlotte, Seattle and other cities in the U.S.
Getting the trainees to actively participate in the training process through activities, such as role playing, helps not only the trainees that are participating to be more attentive and engaged, but also the participants who are watching. A trainer can easily keep the trainees occupied by shifting the attention from himself or herself to the trainees. Role-playing, asking questions, group discussions, and activities can lend variety to a training session, and keep everybody motivated to learn alone and together. During any training session, a trainer will mostly interact with all the trainees together as a group. There will also be occasions where the trainer will only interact with a person or a group for a short duration of time. At the same time, there will be interaction among the participants, formal or informal, during a training session. In most training sessions, trainer to class interaction will dominate the training. The duration of the other two interactions must be kept so that it allows variety, enhances learning and encourages participation. A five-hour training session can have a three and a half hour of trainer-to-class interaction, and one and a half hours of trainer-to-trainee/group interaction and trainee-to-trainee interaction. As most adult learners are used to self-learning or learning by themselves, even when in a class, a trainer can use and promote group learning to offer a new way of learning to the participants. 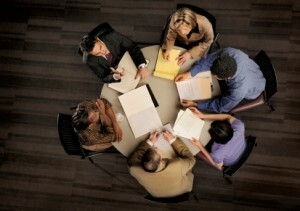 In group learning, the trainer creates the rules and provides broad guidelines on what to do. The trainees act as a group without hierarchy or division, and work together to meet the goal(s) articulated by the trainer. Brainstorming is an effective method of encouraging group learning. It helps to build familiarity, companionship and healthy competition within a class, especially if the training session will run for days. Participants can brainstorm to answer questions, to generate ideas, and to make decisions. In any training session, you will find people of varied personalities. To help each participant be engaged and participate in the training, a trainer needs to build a comfortable and open environment where even the shy and reluctant participants can open up. Instead of using direct questions that bring the attention of the entire class to one participant, trainers can use trainee-to-trainee interactions to build familiarity among the participants. Slowly acclimatizing the participants to the new environment and people is essential. Using varied channels of gaining and sharing knowledge work best to keep the trainees involved and keen to learn.